Storm damage in Michigan comes in all forms. Rain, strong wind, lightning, tornadoes and hail have the ability to wreak major havoc. Did your shingles or siding come off during the storm? Did a gutter come off your home? Did a tree fall on the fence, garage or roof? Are there leaks or water spots on your ceiling? At Action Restoration, we can help you resolve all of these problems and more. Our emergency service crews respond immediately and are available 24 hours a day, 365 days a year. Do you need to start a restoration project after storm damage in Michigan? 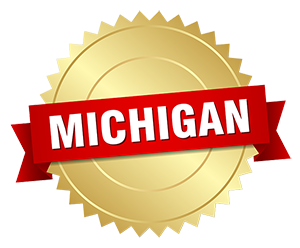 Action Restoration’s storm or wind damage specialists serve homeowners and business owners throughout West Michigan. 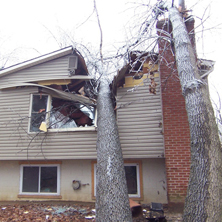 Tree removal: Our expert team can remove fallen trees, branches and limbs from your roof, fence, driveway, etc. Temporary Repairs: We can temporarily repair your home until more permanent repairs can be made or your adjuster can assess the damage. Permanent Repairs: Action has access to a wide variety of roofing and siding materials and can make permanent repairs as soon as we are authorized to do so. Clean-up: Our professional cleaning crews can apply their thorough knowledge and our cutting-edge technology to clean up any mess weather damage may have left behind. Board-up: We will board your house up to prevent any further damage during the restoration period. If storm or wind damages your home or business, Action Restoration specialists will be there to handle all of your damage situations. Action Restoration is on call to help you! Call us today at 616-797-0847!